So I went for a Sporty look…. 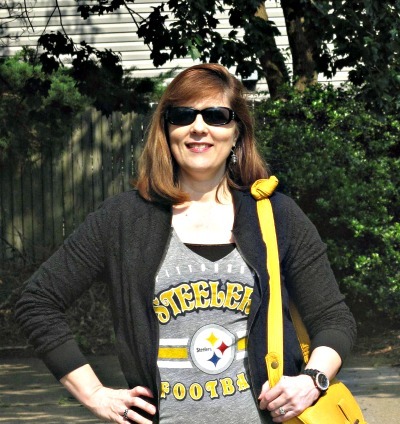 I took the sport trend literally and decided to showcase my favorite sports team…. I am a die hard Steelers Fan! My father and I only had a short 13 years together before he passed,but it was the late 70’s when my Pennsylvania born parents team had an incredible winning streak and I watched every game with my father patiently asnswering every question I threw his way, wanting to learn the rules of the game. My husband bought this t-shirt for me and I love him for that..
Sweatpant joggers and floral Keds add to the sports trend. I had fun wearing this today and it was perfect for bowling! Dear Readers, my oldest came in the door this afternoon saying he was emotional and embarassed. He has spent two nights in his apartment and the silence was defeaning… He’s use to so much conversation and commotion and he was overwhelmed with how much he missed it. I know getting cable in and the internet will help, even if he just puts on music. I told him this is a normal adjustment and that soon enough this will become the new normal , but for right now he is just in a bunch of rooms , but soon enough it will become home. My 18 year old told him that he missed him in the mornings when it’s just the two of them chatting it up as they get ready for school. If that wasn’t enough my oldest always took the trash out to the street and my dear husband put it out too late…. Two days and we are all feeling it already! Can’t imagine how my youngest and I are going to feel when the two others head off in the Fall…. I am grateful that my oldest shared this with us and allowed us all to talk with him as sometimes he is very private about his emotions…. I am grateful for the compassion that each of my other children offered him. I am grateful for the love my children have for each other and how this opened up a conversation on the importance of them all texting and keeping in contact when they are in all directions. I am grateful for my husband’s integrity and the lengths he goes to in busisness to do right for customers. Hi Tracey, thanks for popping over the other day and leaving me a comment. Love your sporty look esp the bag and keds. I knew I would love these sneakers. I would be finding lots and lots to wear with those cute things. This outfit you chose is absolutely perfect.